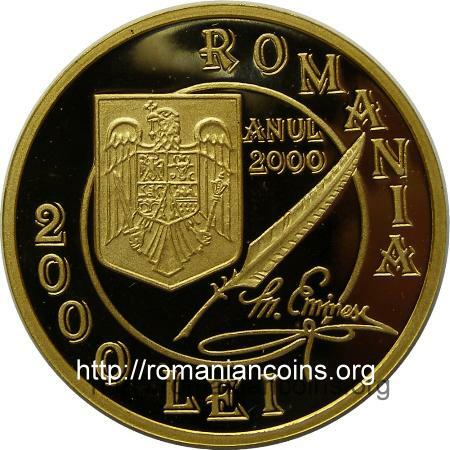 Obverse: face value "2000 LEI", ROMANIA, inside inner linear circle coat of arms of Romania and inscription "ANUL 2000" meaning "YEAR 2000", a feather and the signature of the poet Reverse: bust of the poet, circular inscription "150 DE ANI DE LA NASTEREA LUI MIHAI EMINESCU · 1850 - 2000 ·" meaning "150 YEARS FROM THE BIRTH OF MIHAI EMINESCU"
The pictures of the gold coin above are present on Romanian coins through the kind permission of Mr. J. Ardelean. 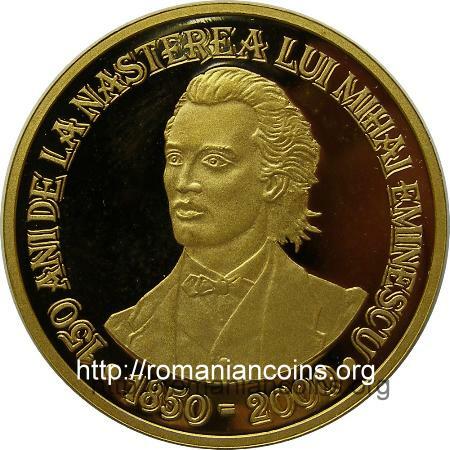 Year 1989 was proclaimed by UNESCO the Mihai Eminescu International Year (at that time 100 years from the death of the Romanian national poet were commemorated). The Soviet Union issued in 1989 a coin with face value of 1 ruble, dedicated to Mihai Eminescu. It must be mentioned that in 1989 Moldavia between Nistru River (Dniester) and Prut River was a socialist republic inside USSR. 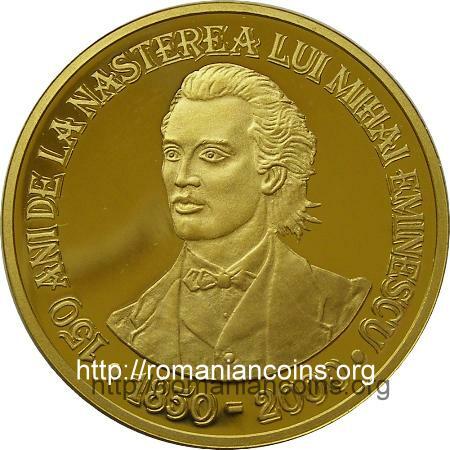 In 2000 the National Bank of the Republic of Moldavia issued a coin with 100 lei face value - 150 years from the birth of Mihai Eminescu. 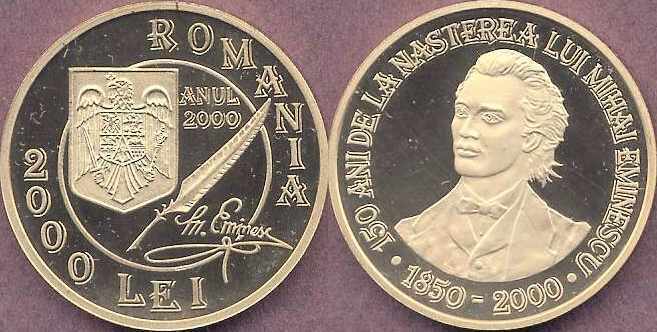 In 2010 the National Bank of Romania issued another coin, with 500 lei face value - 160 years from the birth of Mihai Eminescu. 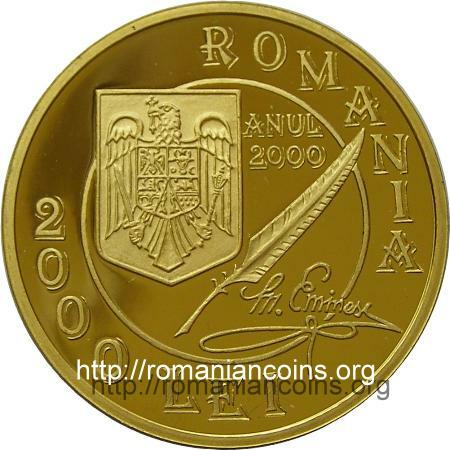 Below are the pictures of an essay of the Mihai Eminescu anniversary coin, present on Romanian coins through the kind permission of an anonymous donor.